Gorgeous apartment sunny south facing terrace, sea views,1 min. from Ramparts. 1 bedroom 3rd floor apartment Old Town Antibes, minutes from beach. This great holiday apartment is ideally situated for access to the beach and Old Town of Antibes, each being less than 200m from the property. It's a spacious air conditioned 1 bedroom apartment on the 3rd floor of a small residence a minutes walk from the sea and Ramparts. Bedroom with access to the south facing balcony, with deckchairs, and sea views from your bed! The living room also opens onto the balcony, they both have electric shutters for the windows, and there is a sun awning for the balcony and table and chairs for al fresco meals. A comfortable sofa turns into a double bed in the living room. There is a flatscreen TV with Cable TV including 7 news channels and 7 entertainment channels in English including Sky News and BBC Entertainment, DVD player with DVD's, stereo and free internet access, telephone with free calls to fixed lines including international . The fully fitted kitchen has a dishwasher and a dining area. Lovely clean modern bathroom with shower unit and hotel style toiletries, and a separate WC with wash basin and washing machine. Provided for the beach are towels, umbrella and cooler bag. Welcome to our apartments in Antibes. We offer fantastic accommodation in 4 lovely holiday apartments in the heart of the Old Town. Each apartment was purchased specifically for it's great potential as a holiday home, each is in a great location and has a terrace or balcony with lovely views. If you choose one of our apartments you will benefit from: A quick and complete answer to your enquiry. A clear description of payment options. A comprehensive welcome guide to the apartment and Antibes sent at final payment. A personalised welcome at the apartment. Rapid response to any questions or problems. Travel cot & high chair use free of charge. Free landline phone calls. Once we've helped you settle in we're just a call away, and if there's something we can't solve over the phone, we'll pop over to lend a hand. 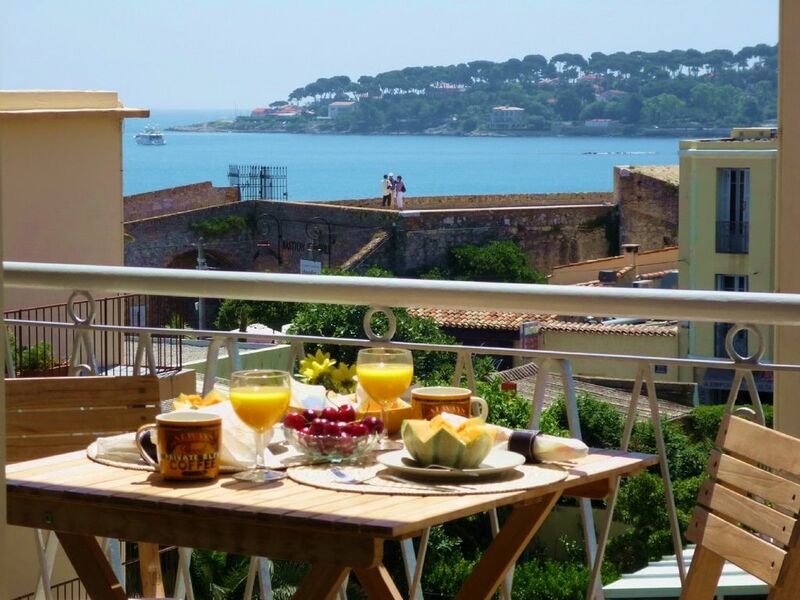 The rarity of finding a sea view property with a terrace in Antibes is what makes this apartment so special. Antibes is a special place, and no matter how many times you visit there are always new discoveries to be made. So if you are about to book your first holiday here, it more than likely won't be your last! It is wonderfully bright, light and airy as soon as you walk in the front door, and has sun all day on the terrace as it is south facing. Free calls to landline phones in France and international including UK and United States. Bath towels, hand towels and face cloths, and beach towels. There is a dining table in the kitchen seating 2-4 people and a table on the terrace seating 2. Table and 2 chairs and 2 deckchairs to laze in and watch the view. We know that holidays are precious, and of the importance of getting everything right, the town, the location and the accommodation, and we feel confident that choosing any one of our 4 apartments will be the right choice and a great experience. All 4 apartments have balconies with great people-watching or sea view, and that has to be one of the top requirements when choosing holiday accommodation. The write ups are honest. The photos are un-altered. There are hotel quality linens and towels. The apartment will be impeccably cleaned. Frankly, this is probably the best all-round location in Antibes. Firstly, Michelle - the local contact - was really helpful. Secondly, the location is the perfect 'compromise' address. It's a gentle 10 minute stroll downhill from the station (we did it with a young family and all our luggage, no problem), it's about the same time to the lovely Salis beach, 5 minutes to the heart of the Old Town and all the daytime and nocturnal buzz, Port and that lovely beach cove down there. Thirdly, the apartment is fine; not a palace, but clean and comfortable with everything you need - we had 2 children (10 and 12) with us and they were perfectly happy on the broad double sofa bed. Oh, and those photos showing the views of the sea - they're definitely real. No tricks. In fact, it's better than that in real life. Yes no tricks! I want all my guests to be completely happy and confident when choosing one of my apartments. Perfect location and very comfortable apartment. We had an excellent stay at Michelle's apartment. The apartment was very clean and furnished very nicely. It is a perfect place to stay as it is located within walking distance to old town and the train station. We enjoyed being just two blocks from the Mediterranean Sea and we loved the sea view from the balcony. Michelle is very professional and we would highly recommend this property. Yes it was a super week weatherwise, really warm for the time of year, and I have no doubt that these guests would have made full use of the south facing sun all day terrace. The property is impeccably decorated and cleaned. It is very well equipped and comfortable. There is a great deal of attention to every detail. Michelle is a wonderful hostess. And extremely friendly and helpful. This apartment's terrace is a perfect place to lounge and get some sun. The view is amazing. We love Antibes, and plan to return. I highly recommend booking here. You will not regret it. Hopefully this place is available :). Thank you for everything! We had a wonderful stay at 'Cap View'. Meals on the balcony, shaded by a canopy, were a real highlight. The apartment was spotlessly clean, superbly equipped and Michelle was very helpful. 'Cap View' is superbly positioned to enjoy Antibes' many attractions and also more mundane, but essential, facilities such as supermarkets. The railway station is about a half a mile's walk away so day trips to Cannes, Nice, Monaco or even into Italy are very easy. The only thing to beware of is that it is a third floor apartment in a building without a lift so it is not suitable for people who have difficulty with stairs. A beautiful apartment in Antibes. Highlights were the view of the sea from the balcony and bedroom - it was wonderful watching the sun go down with a glass of wine. Air conditioning made it a lovely retreat after a day of excursions in nearby Mougins, Cannes, St Paul de Vence and (a bit further afield) Menton. WiFi, dishwasher, washing machine, and a well equipped kitchen meant we felt at home immediately. Michelle looked after us well - our arrival and departure were very easy and we will definitely return! We're recommending the apartment to my parents who plan to visit in the next few months. Antibes is known for its yacht marina, the largest in Europe, with its International Quay, which is home to some of the biggest ’Megayachts’ in the World, its Provencal market, Picasso museum and medieval Ramparts. It has its own sheltered, sandy beach, and is within walking distance to several others. The Provencal fresh produce market runs every day in the summer and is not to be missed. In the evenings it turns into an outdoor restaurant scene, sharing the space with local artists’ stalls. Just behind the market is Antibes’s Cathedral, the setting for outdoor concerts in the summer months. The Old Town is full of lovely cobbled shopping streets, pavement cafes and countless restaurants to choose from. Thursdays is market day in the Old Town with thousands of stalls spread all over, selling anything from bikinis to carpets. On Saturdays, Place National is the setting for an Antiques market. Nearby Juan-les-Pins is a major holiday destination, with a casino and nightclubs.